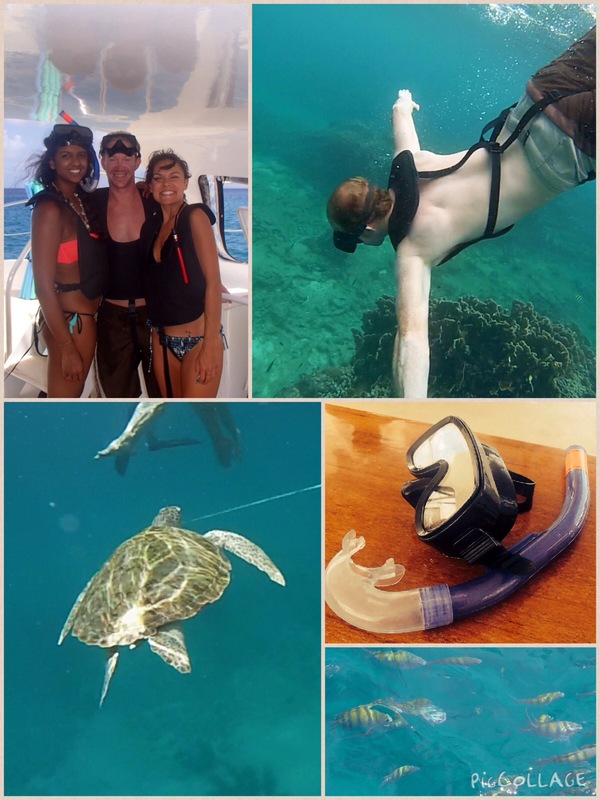 Teaching a frog how to dive… only in Barbados! 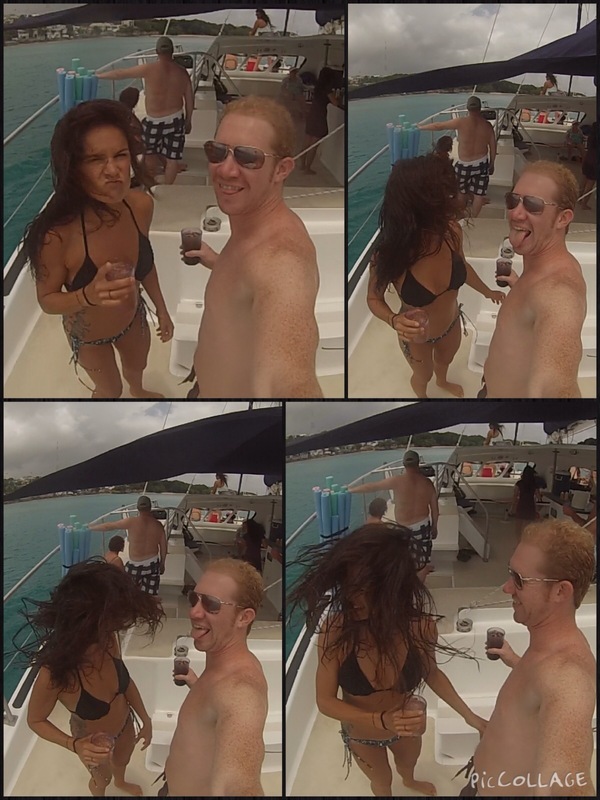 Cool Runnings is an excursion setting you sail on a custom made catamaran through the gorgeous waters of Barbados while providing, food, drink, dance, snorkeling and of course plenty of time to be kissed by the sun. 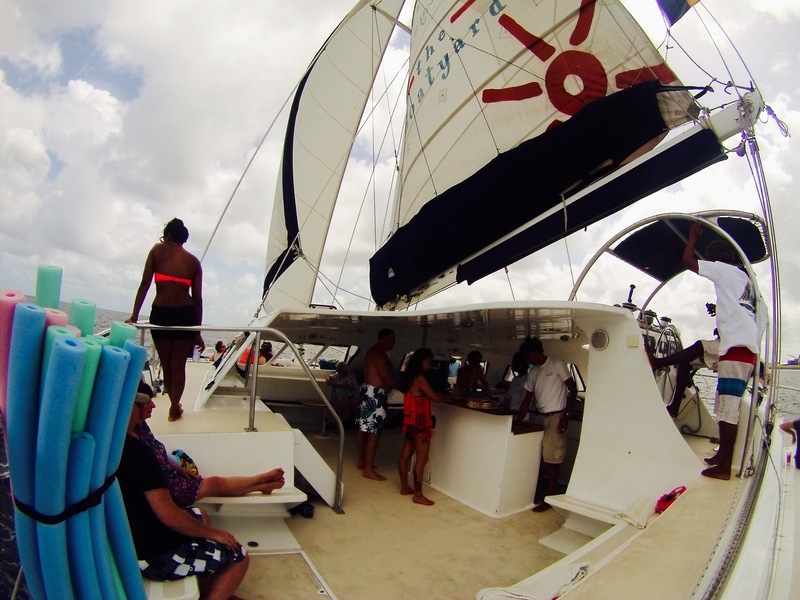 It’s been called the Rolls-Royce of catamaran excursions‘ in Barbados and was voted the 2nd best attraction from the popular Zagat. All with good reason, as you’re treated like royalty from the beginning. Ryan did the honors of introducing this day trip to me and it made such a memory that when I was in the hosting position, I made it a point to pass on the experience. Here are some photos from my first experience of Cool Runnings. On this bright morning I’m like a little kid taking friends to Disneyland for the first time! 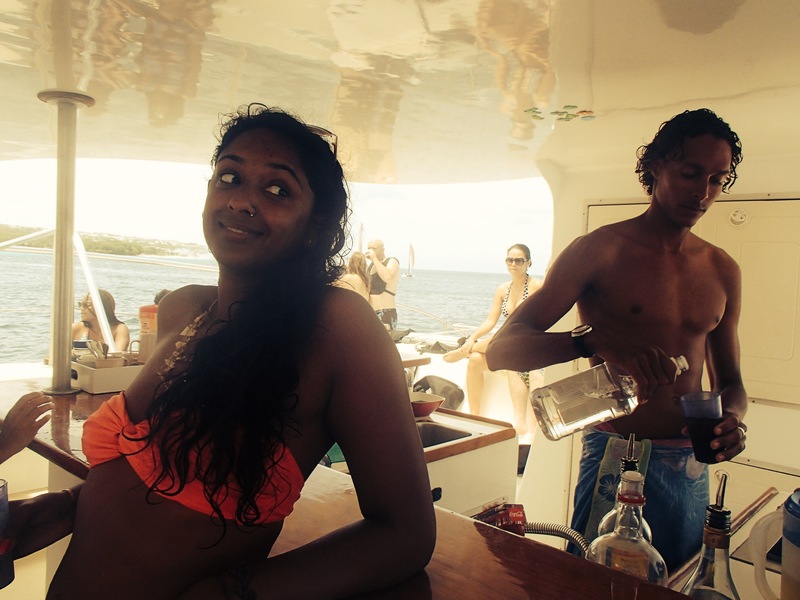 As you board ship, you’re greeted with an open bar and homemade banana bread. Yes, breakfast of Bajan’s. Brunch down and the first juice behind it, we’re off towards the first stop which is an opportunity to swim with tropical fish and sea turltes. I’m going to pause here and define “dive”- a plunge into water executed in a prescribed manner, usually with arms extended and head first. Since we have that clear, please explain to me how Bree managed to complete a dive by entering the water with both feet and hands at the same time after fully extending from what appears to be the position of a scared frog. Be mindful that we also initiated this attempt from a decently elevated height. I’m impressed. 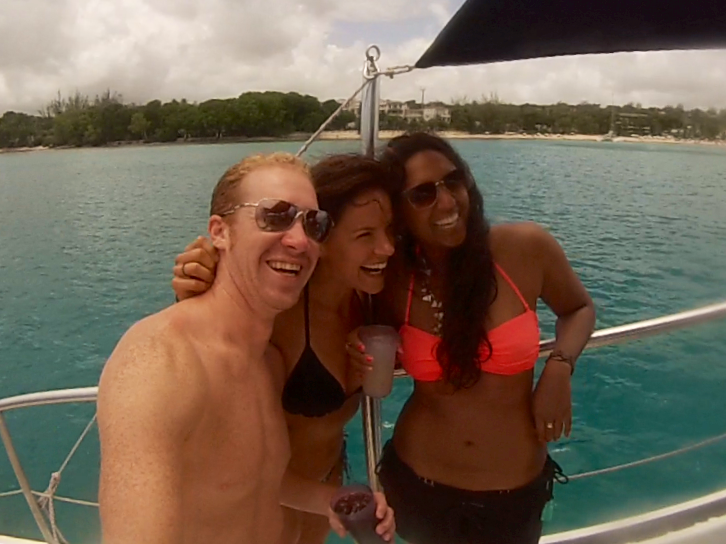 Back to the catermeran for our departure to the final stop which was more swimming and a Bajan Buffett! 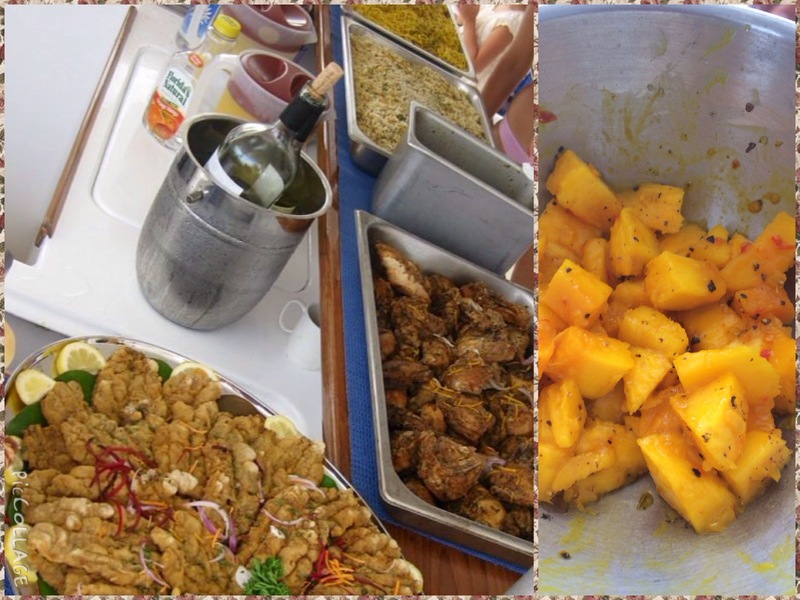 Flying fish, fried chicken, macaroni pie, salad, rice, veggies, spicy mango… and more adult beverages. A few years back, I connected with a warm hearted guy that was an instant friend with conversation that fueled my (already raging) fire for travels. 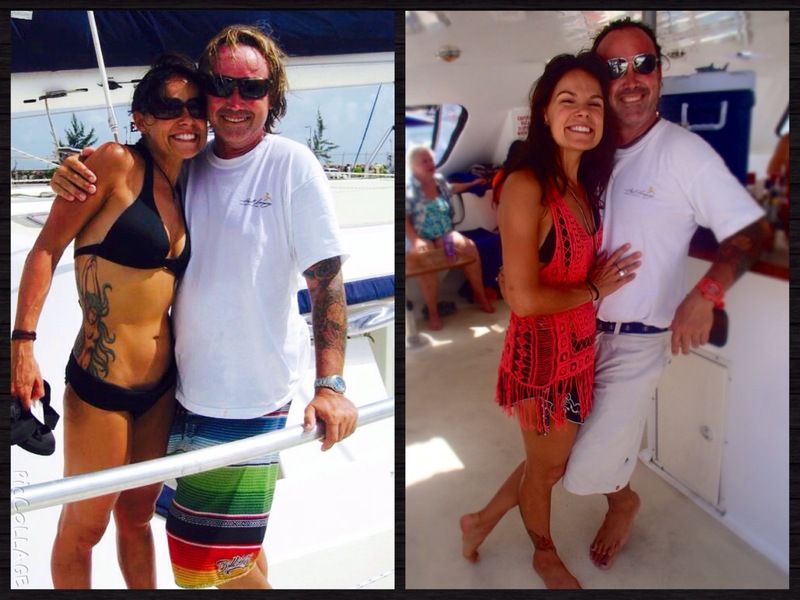 Two years later as I approached the catamaran, I spotted Raymond immediately. Expecting him not to remember just another guest, he pointed and said, “Hand standing around the world… So good to see you again!” Brilliant. Here we are, then and now. 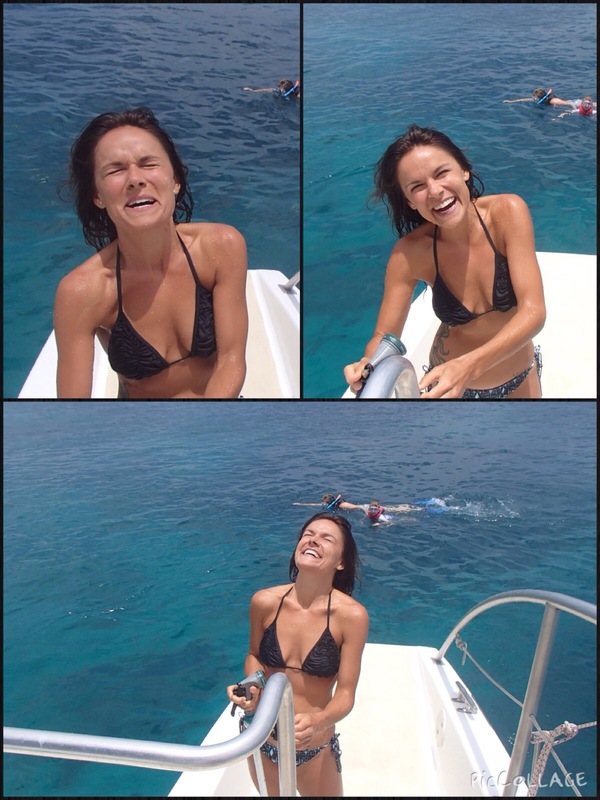 Have you ever felt like a super-model being gently sprayed down with fresh water while gracefully perched on the back of a boat… only to see photos of it later to realize that you more resembled a giggling girl being drenched with freezing water out of a hose while trying to awkwardly brace yourself? Me neither. Here are some random photos taken throughout the day. Good times for sure! 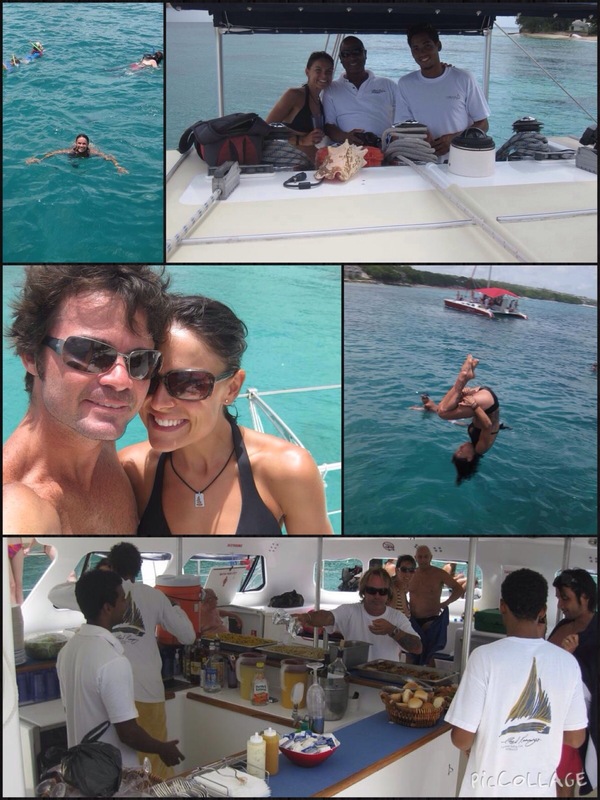 After swimming the clear turquoise waters, devouring lunch and enjoying one (or three) Bajan beverages, it was time for the final stretch back to the dock. What’s missing you may ask? Dancing! 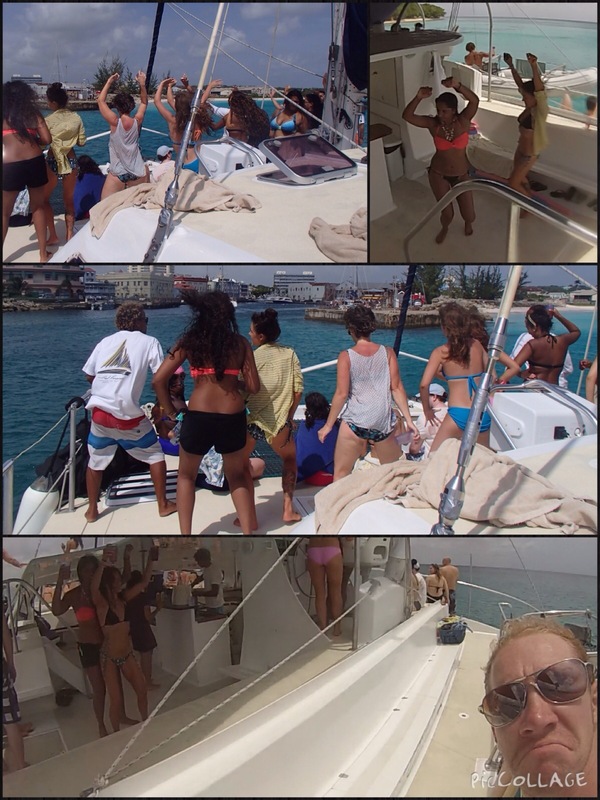 Music gets turned up and everyone braced themselves on deck to wiggle with it. Embarrassed to dance in front of a crowd? Eh, just blame your groove on the rocking boat! Please take note of Hayden’s face… Was he just jealous of our sweet moves? 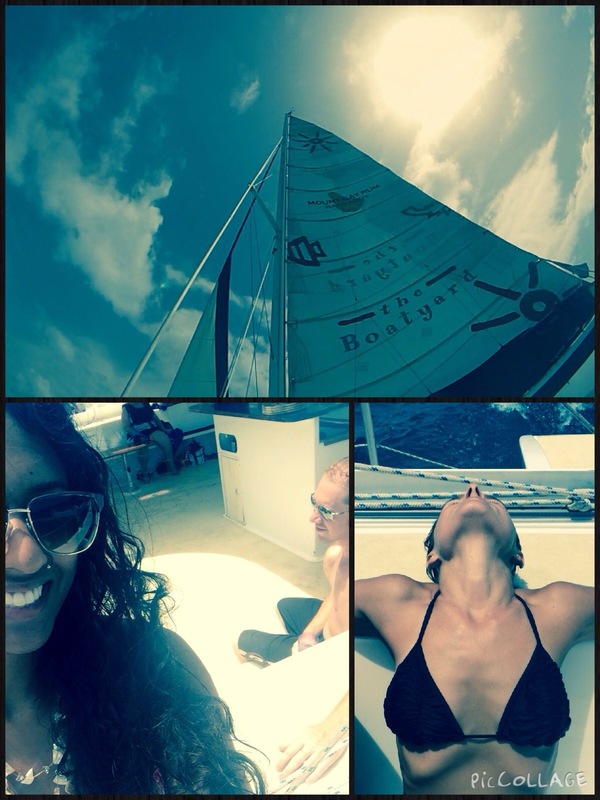 Dear Annika and Robert, this beautiful day and the way it left us smiling reaches far beyond a day at sea. Your kind presence and willingness to make us feel right at home didn’t go unnoticed. Thank you! I am still enjoying you fantastic adventures. Your living such an amazing life. 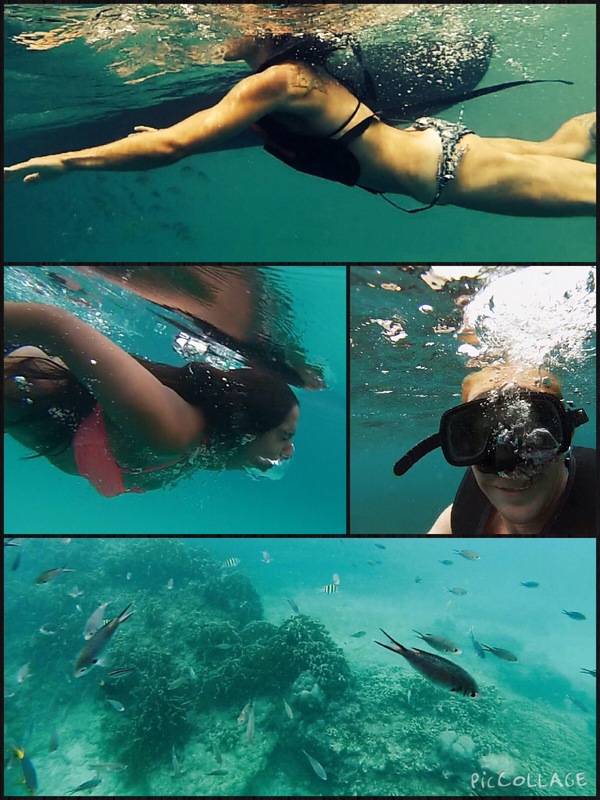 I love this post and the collage of me free falling, limbs first, into the water. Miss you tons! Can’t wait till out next adventure. The amazing things you are privileged to do! Your one lucky lady!